I have not blogged in a while. Many changes in my life kept me busy the last months – a sweet little baby girl, finding a new job, preparing to move into another city, wrapping up everything at my current job, preparing for a big exam and so on. 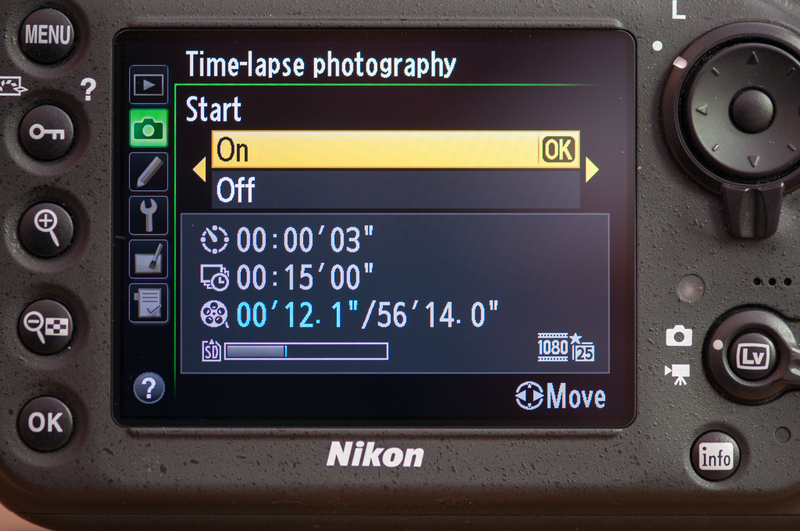 This morning I decided to test the time-lapse function of the Nikon D800. I had two packs of breakfast bacon in the fridge and so I decided to recreate the famous bacon weave which is often done in the weekly internet show Epic Mealtime on Youtube. 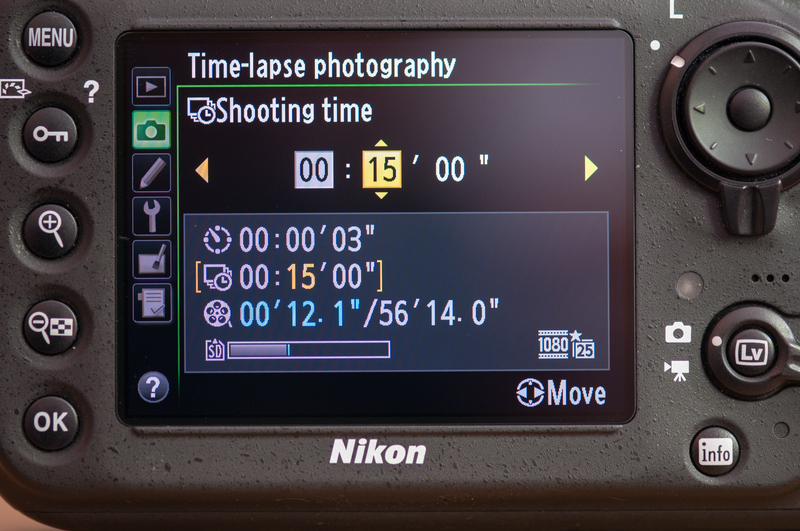 Nikon has really lowered the technical barrier for producing timelapse-videos with the D800. Other cameras can do interval shooting, too (=taking a picture every X seconds). But fumbling them together to a movie requires a separate piece of software and for some people this means that they would not easily dive into new possibilities (I have done it, see laundry folding video and IKEA assembly video here). Use a tripod, align the camera properly, choose your framing. Set the camera to manual focus. This prevents that the focus point shifts from picture to picture, which results in a kind of “wobbly” video. Also it saves battery. Go into the camera menu and choose “Time-lapse photography”. In the next menu you define which shooting interval is to be used. The interval can be specified in hours, minutes, seconds. In the bottom half of the screen the shooting data is summarized (the numbers in blue indicate the resulting movie length: 12.1 sec). The movie length depends on the interval, the duration of the shoot and the framerate of the time-lapse movie ! The current framerate and resolution is displayed in the bottom right corner of the screen. 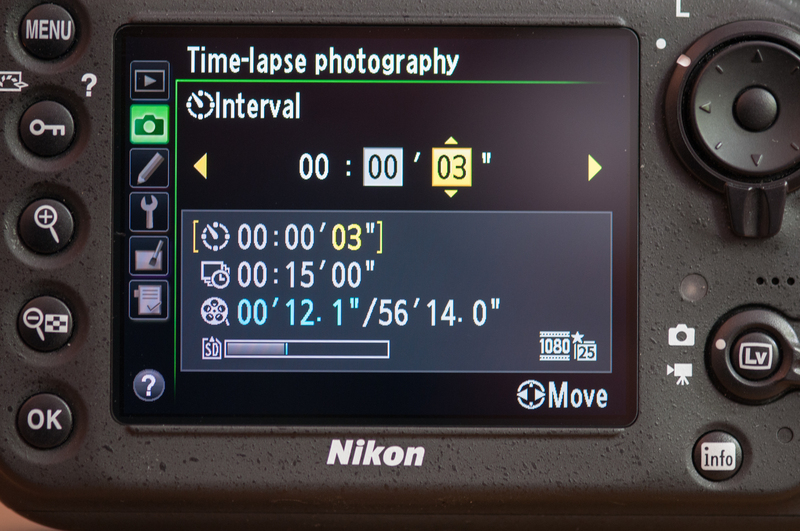 Next indicate the duration of the interval shoot. In this example it is set to 15 minutes. 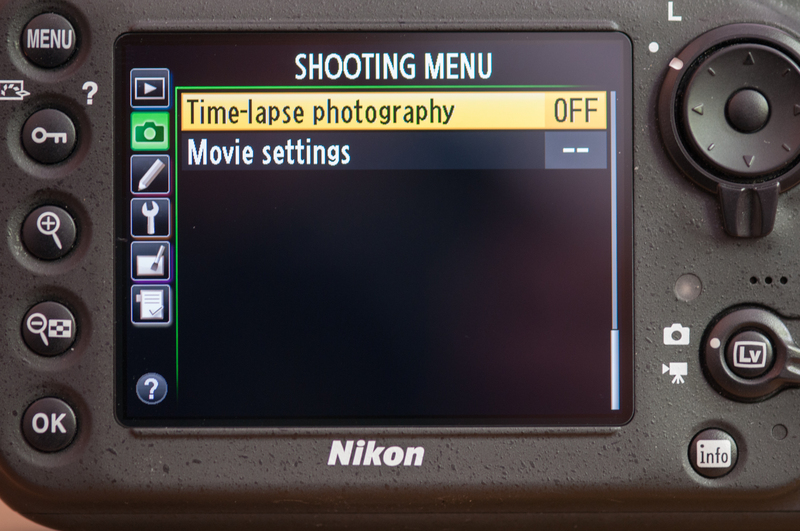 Final step – hit “ok” to start shooting.